Today’s era of change in manufacturing is faster than any seen in history. Getting transformation right in today’s competitive world is critical, and one key factor is the ability to manage and use data to achieve enterprise Strategic Objectives. A Digital Twin is often at the very heart of the metamorphosis. 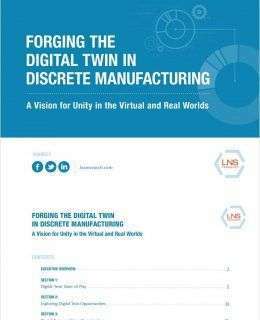 Learn the benefits now, and distribute that information throughout your organization today so the entire staff can start thinking about how they can put the Digital Twin to work in their role.